A resort vacation is always at your fingertips with Go Vacation for Nintendo Switch. From sky diving and beach volleyball to tennis and even snowball fights, Kawawii island offers something for everyone, with more than 50 different games and activities to enjoy. 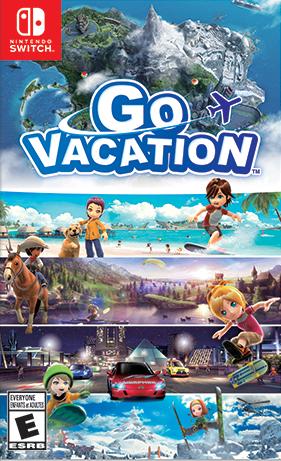 Go Vacation includes a variety of cooperative and competitive games that can be played solo or with up to four players via a single Nintendo Switch system or local wireless. Several activities offer the option to use motion controls, making swinging your tennis racket and throwing snowballs even more fun and immersive. Discover new surprises each day as you adventure through the four different resort areas on Kawawii island. While exploring -- either on foot, on horseback, on a snowmobile or more -- you’ll discover numerous collectibles, challenges and other opportunities to level up and customize your character. Decorate your own villa, enjoy a delicious meal at one of the food trucks and snap in-game photos of the dozens of adorable animals hiding in each resort. Regular challenges and presents, like special costumes and different dog breeds, will keep you coming back for hours of Kawawii island adventures.